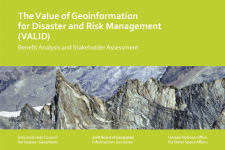 On 3 September 2013, the report was launched by UNOOSA at the Vienna International Centre. Congratulations on this very informative document. I do have one comment. Table 4.4.4 summary of major satellite systems (page 71) contains a number of errors. Landsat 8 was launched in February 2013 and the data are now freely available from the USGS at http://earthexplorer.usgs.gov/. Also, Landsat 5 (decommissioned) and Landsats 7 and 8 are "owned" or operated by the U.S. Geological Survey (USGS) per agreement with NASA and all Landsat data has been available for no charge from the USGS since 2008. Thank you for your feedback, we will pass it on to the authors!